The Guntur average altitude (elevation) 30 meters above sealevel. The Nearest Airport to Guntur is Vijayawada Airport.The Collectorate office for this district is Joint Collector Office, and other popular district head offices are District Cooperative Office, Guntur, District Resource Center Rajiv Vidya Mission, District Water Management Agency, District Sub Jail, The nearby Fire service for this district is Fire Station. The District Library is Central Library Guntur.The Head Post office for this district is in India Post. and the Railway Station is Guntur Junction (station). We don't have good Road facility From Vinukonda to Dondapadu via Thimmaipalem. the road was laid 10 years back. there are so many digs and patches on the road. please help on this issue. Hi sir /madam,my name is jagadeesh and iam the resident of pregnam village. In 2015 our villagers was not cultivated any crop because of lack of water and insufficient rains. my villagers all are depends only on agriculture.for this year 2015 our villagers loss a income and rice too.so we are requesting you to provide a rice in reasonable prices to our villagers and support economically. Bramananda Reddy Stadium and R T C Bus Station are constructed in RED TANK and towards the east of RED TANK is OLD GUNTUR. 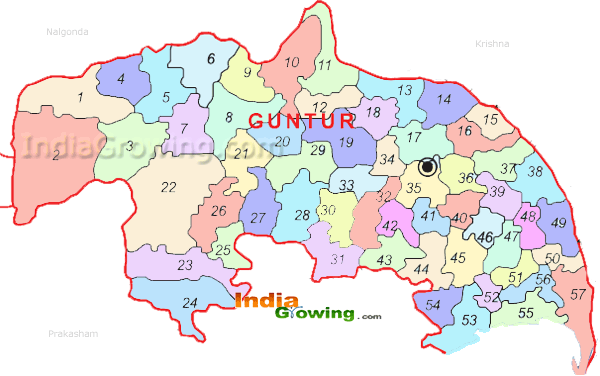 Balaji Nagar, Gandhi Nager, Vinoba Nager and Ali Nager are the part and parcel of OLD GUNTUR. the lord shiva temple in my village has been ruinous for the past 3yr and there is no caring to build it back.so plz take proper action to establish it back.